There’s some good stuff happening in the area this weekend. Here are some fun events for good causes to check out. Tonight, there is a benefit at Comet Ping Pong to support Transformer, a non-profit visual arts space at 14th and P NW. There’s a $10 cover and $1 PBRs, featuring an art installation, live music, a DJ set and dancing. This Saturday is the 17th Street Festival. It will be taking place on 17th Street between Riggs and P St NW from 2-6 pm. There will be musical performances, vendors, and activities for pets and kids. In conjunction with this festival, there will be a showing of Batman at 8pm at Stead Park (1625 P St NW). Profits from the festival will go towards Ross Elementary. 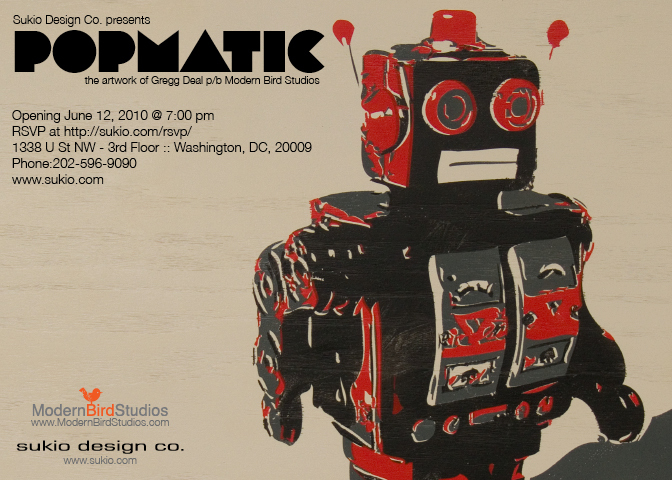 Come to the opening reception of Popmatic this Saturday, 7 pm, at Sukio Design Co (1338 U street, on the 3rd floor). There will be food, music, and an overall good time. You can RSVP at http://www.sukio.com/rsvp/. In his first solo show, Gregg Deal showcases his first big body of work that use the influence of his graphic design, sign making and fine art painting background. His work is stylized and bold in color and composition. Suffering through the current economy and consumer culture, Gregg finds commentary on pop-culture, the ever contested ‘cannon’ of art and his thoughts as a Native American in the world we live. Gregg is also a cycling enthusiast and runs District Cycling , a cycling blog that was recently showcased in Washingtonian’s Blogger Beat, the week after U Street Girl was featured. The show will be at Sukio through July 30th, so if you can’t make it on Saturday definitely check it out afterwards. Did you make it out to ReadySetDC’s Activation 2719 in Columbia Heights over the winter? 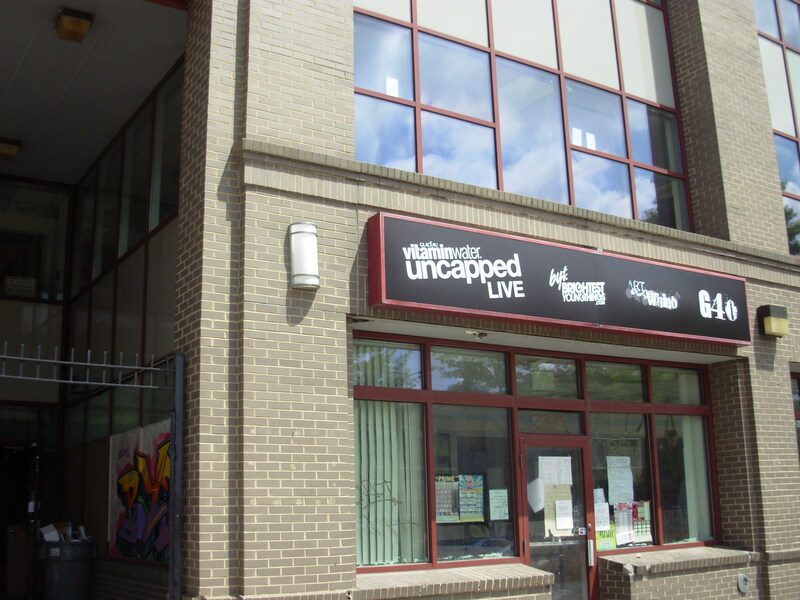 Well if you did or did not, they’re hosting another pop-up gallery, this time in the Shaw neighborhood, titled Activation 440 (at 440 Rhode Island Ave). They will have opening nights tonight (which is sold out!) and tomorrow. The event is free but you need to RSVP to attend. There will be a ton of artists showing, as well as DJs and a cash bar. If you can’t make it out this weekend, the exhibit will be open through the end of the month. Nocturnal Vibe will be hosting its first Capitol Skyline Hotel Saturday afternoon pool parties. Nocturnal Vibe is the brainchild of Doug Van Sant, who writes about and takes photos on DC nightlife on a U Street Girl favorite blog, Urban Marinade. It will be $15 at the door and will include $8 drink specials and $5 beers all day long, including a Liquid Lounge cocktail for $5. Sounds like a good time! Have you seen the Pop-up Living space on U street between 13th and 14th? It’s actually performance art called “Live” by artist Andrew Wodzianski. He will be living in the space from April 19 – April 30th. As I learned from Merin Guthrie, of the Cultural Development Corporation, Wodzianski is using his living space as a stage for a performance-based piece that explores everything from small space living, multifunctional design and ‘rear view window’ voyeurism to instant celebrity and social isolation. You can see a live stream of the exhibit as well. Fellow artist Scott Brooks tells me that while Wodzianski is gone now, he should be back around 2 pm. The second exhibition in the U street area will be entitled “Work.” Via a process in which they will exchange ‘Shawbucks,’ a community-based currency, for objects of value to residents and businesses along the 9th Street corridor, Team Work will explore the meanings of value in the community: the value of art, space and commerce. Ultimately, the installation at the Moderno at 12th and U, titled “Here or There,” will consist of mementos and objects from residents of the Shaw and U Street neighborhoods that show how these residents make a living. The DC Commission on the Arts and Humanities is holding their 2010 Porter Colloquium Reception honoring African American art and culture. The reception is at Howard University’s Gallery of Art. To RSVP email Zoma.Wallace@dc.gov. Plan B (14th and Q) is having its opening reception for its exhibit Inside/Outside: showing, through various media, interpretations of interiors and exteriors. The reception will be from 6-8 pm and depending on the weather (which looks like it will be nice) Sauca, the popular food cart, will be outside serving food.